Van life and extreme adventuring go hand in hand. A van can take you to destinations way off the regular tourist track, to remote and amazing places. This is one of the best things about living in a van and travelling in a van– treading a path that others are yet to find. But, what if the worst happens? What if disaster strikes and you’re stuck in a real-life emergency situation? Do you actually think that a $20 basic first aid kit is going to get you very far? No, we thought not. 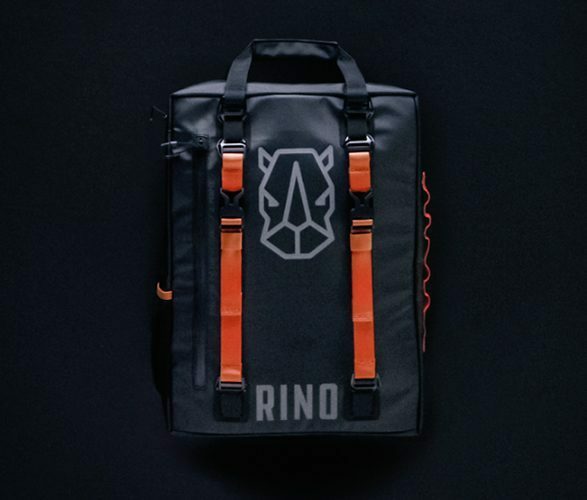 We’ve previously shown you several products that can help with off grid living and survival such as the Bear Grylls water bottle and the best power banks, but today we’re looking at the ultimate, all-around best survival kit out there- Companion, brought to you by RHINO Ready. Are you a Van Lifer or Weekend Warrior? Join our Facebook Group! Whether you’re living the van life full time or are a proud weekend warrior this is the best survival kit out there and is one of the van life essentials that you, or any vandwellers you know, need in your life. If you’re living off the grid in an off grid van, are a digital nomad or, simply just an outdoorsy person then the Companion survival kit is a must-have. Is The Companion The Best Survival Kit Ever? So, what makes the Companion the best survival kit we’ve seen? Designed to save lives after a flood, fire, hurricane, earthquake or any situation that puts you in survival mode the Companion, when fully stocked, includes everything you could possibly need to stay safe in the immediate days after the incident. Those first 72 hours, or three days, are the crucial hours for survival and this, the best survival kit out there, is designed to keep not one but two people safe over this vital time. It is during these first three days that one would hopefully be able to reach a point of safety, contact the emergency services, or for someone to find you and give assistance. The Companion is an appropriate survival kit for any climate or geo, so can be taken with you wherever you go in the world, all year round. One of the things that makes this the best survival kit out there is the fact that it is so portable; the Companion is cleverly designed to contain all of the essentials for survival within a bag that is no larger than your average backpack. The kit can be carried on your back like a backpack, or the straps can be tucked away for easy storage, in the home, car, office or even within another, larger trekking backpack. 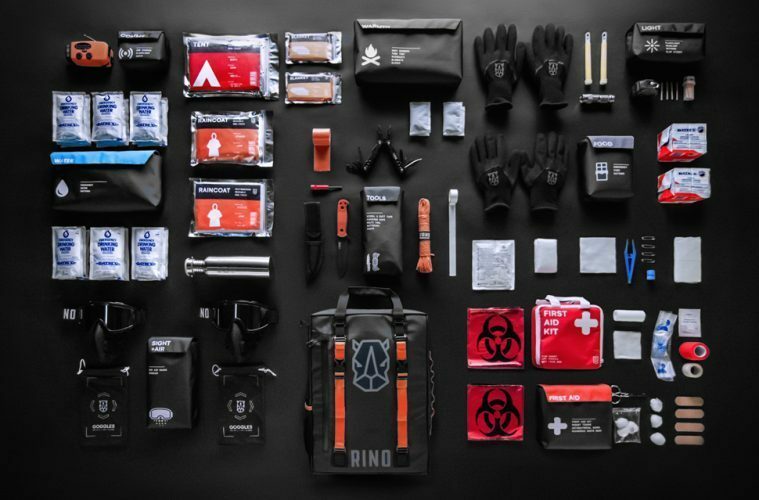 First aid, warmth, light, comms, water, tools, sight and air, and food are considered to be, by the makers of the best survival kit on the market, the eight essential elements for immediate survival when you find yourself in a desperate situation. And, of course, RHINO Ready’s Companion, provides all the equipment needed to cover all eight points. The first aid kit included within the best survival kit far surpasses any cheap kit you might currently carry with you or store within your home or office. Everyone should own a first aid kit to help out when accidents happen, and this kit provides a comprehensive list of equipment and over 100 items to help you deal with any injuries- be it small or significant. The first aid kit meets all US Government guidelines and far surpasses them by including everything you could possibly need if an accident occurs. The first aid kit is encased within its own bright red pouch so as to be easily identifiable and unzips all the way around for easy access. Also included is a guidance leaflet with points on how to give proper first aid. Even in the warmest of environments, it is likely to cool down substantially during the night. As keeping warm is one of the essentials to survival, the Companion provides equipment to help you stay warm and dry. The Companion isn’t the best survival kit out there for nothing; when it comes to warmth it gives not one, but three layers to help you survive. Each kit includes x2 standard thickness blankets designed to keep you warm through the night, x2 reusable raincoats because staying dry is the first step to holding body heat, as well as a weatherproof tube tent which is big enough to sleep two adults. On top of this three-layer protection system, RHINO Ready’s Companion also includes 2x pairs of waterproof gloves designed to protect against the harshest winter environments, and x4 hand warmers to give you an extra boost of heat when in dire need. All of these items are bright and/or include reflective elements, hoping to attract the attention of those who can offer help. One of the best ways to keep warm is to build a fire and, of course, the best survival kit out there includes tools to help you do so. The companion includes a knife with a fire starter, as well as x10 stormproof matches. The best survival kit out there wouldn’t be complete without means to provide light in the dark. Well, the Companion offers four different ways to access light for those long nights. A bright, 300-lumen flashlight which, naturally, has a weatherproof casing; a headlamp to provide handsfree light; and if for whatever reason the batteries included to power these two options fail, you are also provided with two bright glow sticks which give you 12+ hours of light. The final source of light comes from the fire that the best survival kit can help you ignite with the previously mentioned storm proof matches or knife with fire starter. No matter how off gird you’re going, most people wouldn’t be without their mobile phone. They’re so part of everyday life and are a great safety back up measure, and you can nearly always call for the emergency services no matter how lacking you are in signal. But, what happens when you’re phone battery runs out, and then your battery pack battery runs out too. Without any mains electricity to charge, either you’d be left stranded without any way to contact help. Well, you wouldn’t be with the best survival kit, the Companion, as it includes a rechargeable battery pack- rechargeable by either solar power or a crank that you turn by hand. With this portable solar charger you can have power, no matter how desperate the situation. As well as a means to charge mobile phones the battery pack also doubles as a flashlight, meaning this can be recharged in the same way, and triples as a radio meaning you can stay in the loop with what’s going on in the world. Of course, this three in one, rechargeable unit is weatherproof, shockproof and has a durable exoskeleton. Without water, there is no life, so it is therefore essential that the best survival kit includes the means to stay hydrated. Again, the Companion has multiple ways on how to fulfil this necessary point. If you are by a water source- a lake, stream or river for example- there are two ways to stay hydrated within RHINO Ready’s Companion; tablets or boiling. There are ten water purification tablets included within the companion, with each purifying one litre of water. This means you could have ten litres of water, using the tablets, over the 72hr period. If more water is needed, you can boil the water to purify it. Do this over an open fire (lit using the matches or knife) in the metal water bottle provided. To use the bottle to boil water, simply twist off the lid, and you’re good to go. The Companion’s water bottle is lightweight, durable and easy to carry. If you cannot find a water source to collect water from to purify then don’t fear, for the Companion provides 18 Datrex water sachets- three per person, per day; enough to keep you sufficiently hydrated. If you find yourself in a survival situation, particularly if you’re stranded in the wilderness, then the chances are that you’re going to need some tools to help you survive or get out. Of course, the best survival kit out there doesn’t fail you in this area. Included within the Companion is an extensive multi-tool which boasts needle nose pliers, rugged grip wire cutter, spring-loaded knife, a saw, a hook remover, Phillips and flat head screwdrivers, a can opener, a file, and a bottle opener. If this isn’t enough, you are also provided with a substantial 5” knife. The knife is lightweight, non-serrated injection moulded, includes the durable fire starter and comes in its own sheath sleeve. 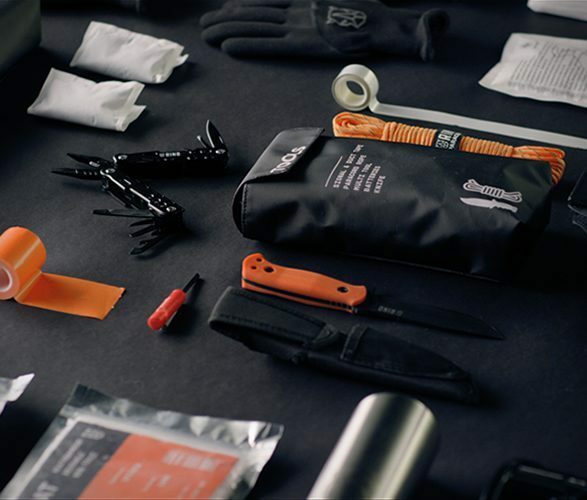 On top of this, the best survival kit contains 50’ paracord, 5’ duct tape and 3’ signal tape, all in a bright, highly visible orange to attract people’s attention. If you find yourself in a situation where your visibility is compromised, and you’re struggling to breathe the Companion is here to help. The best survival kit out there includes goggles to protect the eyes with UV guard, light sensitivity and heat reflection. The reflective surface of the goggles can act as a signalling mirror, and the fit can be adjusted as well as being able to fit over prescription glasses. The two N95 masks provided ensure that you can breathe easy in a situation where you may otherwise be struggling, and give peace of mind for anyone in a survival situation. Food is the final point to cover and, of course, the best survival kit comes stocked with enough high-calorie food to keep you both nourished for the full 72 hours. The food comes in the form of 12 200kcal biscuits, each which are non-GMO, nut free and vegan. They may not be the tastiest, but you’ll be pleased to have them if you find yourself in dire need. All of the above comes stored in its own easily accessible pouch within the rucksack which opens like a book for easy access to all compartments. 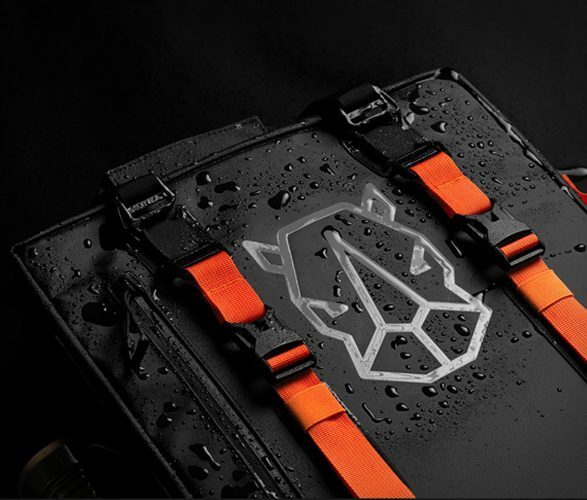 The backpack itself is made with the highest military grade materials that are completely water and fireproof meaning all of your survival goods are protected for use, even in the harshest of conditions. Also included is a guide on how to survive using the tools provided, giving you the key fundamentals in survival. 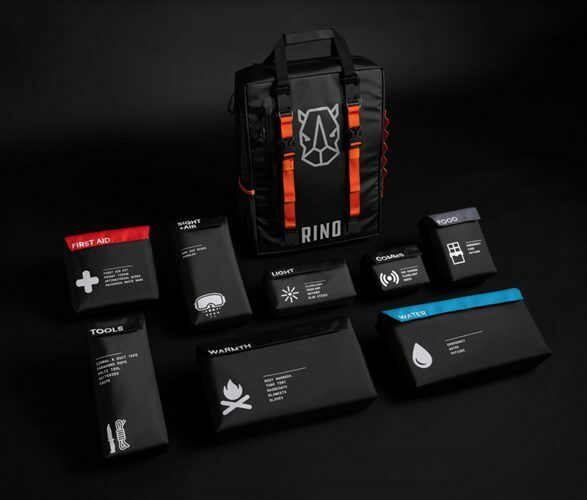 We love RHINO Ready’s Companion pack and really do think it’s the best survival kit on the market. This pack is a must have for any adventurer or anyone that lives, works or travels in an area with a risk of floods, fires, earthquakes or hurricanes. Rhino Ready’s Companion is currently running as a Kickstarter and has already generated over $480,000 (of a $25,000 goal) in just over a month. A fully stocked Companion pack currently requires a Kickstarter pledge of $299 or more- this may seem pricey but can you really put a price on having the best possible chance of survival? We think not. Products are due to be delivered by July 2019. We’ve got all you need to know about full time van life. Have you ever seen anything as weird and wonderful as this modified campervan? This Harry Potter House is not for muggles or squibs!